This book traces the history and development of the Quality movement by focusing on its early authorities and by comparing, contrasting, and placing their theories in a modern context. The author's "Rings of Management" shows how the various philosophies can be synthesized into a strong unified effort. 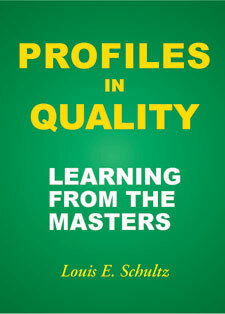 These short biographies tell the story of people who helped make quality happen. They reveal how the concepts of quality were products of their time, as well as how they have evolved. For that reason it is a good reference book. Subjects for the biographies include Shewhart, Deming, Juran, Sarasohn, Ishikawa, Taguchi, Kano, and others. This book was out of print for several years, but has been reprinted due to customer demand.